Wind power in Northern Canada has had limited success. Conditions in the area can be challenging for rotating machines and the variable nature of wind makes it difficult to integrate with diesel power plants. As a result, one of the best wind resource regions is largely unexploited. Glencore’s Raglan mine demonstrates that these obstacles can be overcome. With $7.8 million in funding from the Government of Canada, Tugliq Energy Co is reaching new heights in harvesting wind energy at an industrial scale through its Glencore Raglan Mine Renewable Electricity Smart-Grid Pilot Demonstration project. Tugliq Energy used a flywheel – a mechanical device that stores energy created by a spinning wheel – to successfully manage wind power dips and drops without tripping the security mechanisms of the Raglan diesel micro-grid. 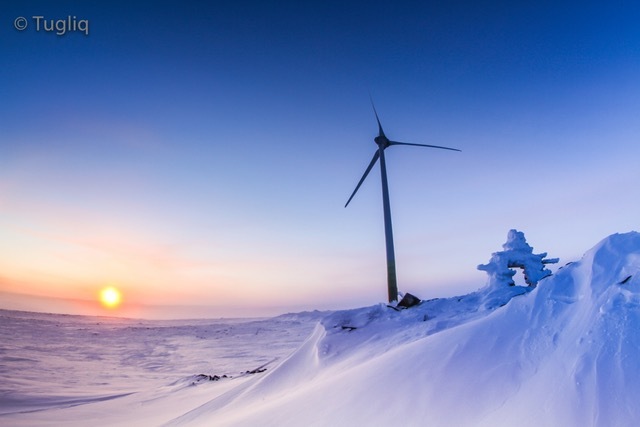 The project deployed an Arctic-rated 3 MW ENERCON E-82 E4 wind turbine generator. A spider-like steel foundation was engineered for the turbine in order to alleviate potential problems associated with melting of ice lenses in Raglan’s permafrost, should global warming accelerate over the 20-year lifecycle of the turbine. It is also equipped with a cold winter package that includes blade heating ​by air convection​. A Hatch Microgrid Controller (HμGrid) monitors demand for wind power, and variations in supply, to produce a smooth power output that enables high (50%) wind power penetration in a cost-effective way. The wind turbine has successfully operated for three consecutive years, delivering 20.1 GWh of renewable energy to the Glencore RAGLAN Mine, abating 5.1 million litres of diesel and 14,424 tons of CO2 equivalent in greenhouse gas emissions. Through 2015 and 2016 the wind turbine achieved a record-setting 97.6% uptime average (among the world’s best in 3MW class). The wind and storage system will be monitored for a minimum of five years. Acting as a flagship site for future industrial-scale wind power development in the region, Glencore’s Raglan mine successfully demonstrates that harvesting wind energy can improve long-term economic stability and energy security, and reduce greenhouse gas emissions and the environmental footprint of Canada’s northern mining operations and communities. The company is currently installing another wind turbine, with even more storage.